We represent clients throughout Westchester County and all of New York who have suffered serious injuries when they slipped or tripped and fell while in someone's home or place of business. These injuries can occur on a flight of stairs, a patch of ice, an uneven sidewalk, a slippery supermarket floor, an improperly leveled elevator, or a poorly maintained floor. When accidents or injuries occur to visitors or tenants, the owner of the property may be legally responsible if it was negligence or recklessness that led to the injury. We are committed to identifying the exact nature of the property owner’s negligence and establishing how this negligence caused our clients’ injuries. We fondly remember one of our cases, involving a young union carpenter, who was injured at work while he was pulling a rope wheel and injuring his back. His accident report failed to state that there was rubble and debris, which caused him to trip, stumble, and twist, but he did not fall. This young man, like so many other construction workers, was so used to working in an environment where rubble and debris were common place, that he did not even complain about it or think to do so. When we were actively negotiating with the insurance company, for the first time during mediation, they raised what they thought was their ace in the hole—he did not fall. In fact, they revealed the existence of a witness who was working with him and gave a statement that he did not fall. Our attorney’s reaction at the mediation floored them—“That’s great!” In fact, our attorney pointed out that this “witness” confirmed our client’s version of events. He did not fall. He tripped, stumbled, and twisted, which, we pointed out, was a competent producing cause of the herniated disc in his back, for which he later underwent surgery to repair. As a result, the case settled within a week of the mediation, after the insurance company and their defense attorney completely re-evaluated the case and offered significantly more than they previously had. Slip and fall injuries are a significant safety issue for our clients, and are particularly dangerous for the elderly and those with disabilities. Slipping and tripping accident account for many people suffering broken limbs, torn tendons or ligaments, and back and neck injuries. Owners of businesses and property are obligated under the law to make the parking lots, walkways, buildings and floors inside the premises reasonably safe. For parking areas, owners usually retain one set of contractors to perform snow and ice removal from parking areas with plow trucks, and often a different company or individual contractors to clear pathways with shovels and snow blowers. Sidewalk accidents happen for a variety of reasons. 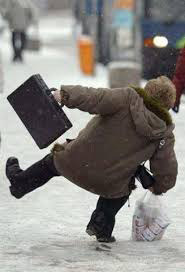 During the winter months, many people suffer injuries in slip and fall accidents due to improper maintenance of sidewalks, including a failure to remove snow and ice, improper or inadequate shoveling, or a property owner or tenant’s failure to apply salt, sand or other chemical to prevent an accumulation of ice. The winter also causes defects such as raised sidewalks, cracks, missing sections, or other defects which can lead to serious knee, back, arm, ankle or head injuries (if the person is unable to break his or her fall). Under the laws of the State of New York, in order to be successful in a case against a property owner for injuries suffered in a slip and fall or trip and fall accident, the injured person must be able to establish either that the owner knew of the dangerous conditions prior to the accident (obviously much more difficult in an accident due to a more transient defect such as ice than an uneven sidewalk which develops over a more substantial period of time), and failed to correct the defect or remove the ice, directly causing the accident. The property owner can also be held responsible for the accident if he or she “created the condition.” An example of this would be an owner who hires a contractor to perform work on the sidewalk, and this work is performed inadequately or with defective materials which make the sidewalk unsafe for pedestrians. In this scenario, both the property owner and the contractor can bear responsibility for the accident. In cases involving sidewalks or other property owned by municipalities, there are several additional requirements which make these cases more complex, requiring the services of knowledgeable attorneys who are fully familiar with the these complexities and rules of law. For example, in a case of a slip and fall on a sidewalk against a city, town or village, a notice of claim on behalf of the injured person must be filed against the municipality within 90 days of the accident, or the injured person cannot sue. Further, municipalities have to be provided written notification of a condition prior to an accident (which is a virtual impossibility in a slip and fall due to ice), otherwise, the claimant cannot successfully pursue a case against the town, village or city. In some cases, it is necessary to retain the services of professional engineers, architects or other professionals to inspect the sidewalk to make an assessment as to whether there are violations of the local building codes and other municipal statutes. Our compassionate injury attorneys consider all of these factors and will represent you aggressively so you can take care of what is most important—recovering from your injury, regaining your health, while we work to obtain the maximum monetary recovery for you.